Made of soft, quality leather. 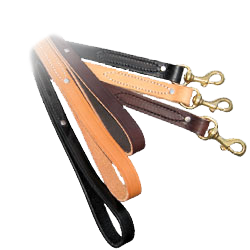 Burgundy latigo, black latigo, and English bridle brown. This leash is popular for trained police dogs, but it also makes a stylish lead for any dog. It is hand cut, rivet-less, and it braided at each end. Our finest heavy leather, hand sewn and riveted with an Italian brass snap. Excellent for police K-9 and obedience work. The edges of this leash are not beveled. Available in black, tan and brown leather. A great leash for trainers and handlers. Our most popular obedience leashes are now available at a mix and match price! Choose latigo leather in burgundy, black, or brown English bridle leather. All leashes are hand cut, hand sewn and riveted. The edges are beveled for extra handling comfort. 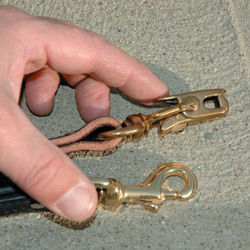 All leashes have solid brass snaps. A lighter weight, thinner version of our popular Braided End Leash. 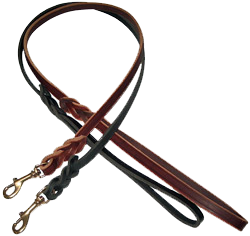 Burgundy, English bridle brown or black latigo. This leash is popular for trained police dogs, but it also makes a stylish lead for any dog. It is hand cut, rivet-less, and is braided at each end. Made of soft, quality leather. A lighter weight, thinner version of our popular Braided End Leash. 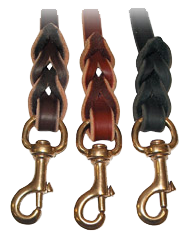 Burgundy,English bridle brown or black latigo. This leash is popular for trained police dogs, but it also makes a stylish lead for any dog. It is hand cut, rivet-less, and is braided at each end. Made of soft, quality leather and with a Ring in Handle. 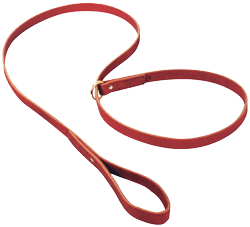 This leash is made of 3/4"x 5' or 3/4" x 3' latigo leather and is designed with two handles for oversized dogs. It is an excellent leash for the person with limited strength who needs extra control. Available in burgundy or black. Allows you to walk two dogs with one leash. Available in burgundy, black, tan or brown. Made of soft leather in 2 widths. Burgundy, black or tan. A must for kennel workers, veterinarians, trainers, and animal control officers. Often used with Assistance Dogs. Made of the finest leather, this multi-faceted leash allows for 6 different connections and uses. Total length of leash is 7'. Available in black, tan, burgundy, and brown leather. 3/4" has brass snaps - 1/2" has nickel snaps. 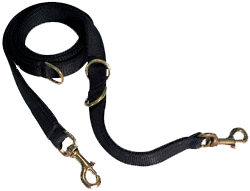 7/8" x 6' heavy duty pro leash leather. This popular police K-9 and multi-purpose leash comes with a standard bolt snap on one end and either a quick-release snap or another standard bolt snap on the other end. 3/4" x 6' standard obedience latigo leather. This popular police K-9 and multi-purpose leash comes with a standard bolt snap on one end and either a quick-release snap or another standard bolt snap on the other end.